The local roadside strawberry stand opened back up for business, so I thought a Strawberry Shortcake would be a great introduction to spring. 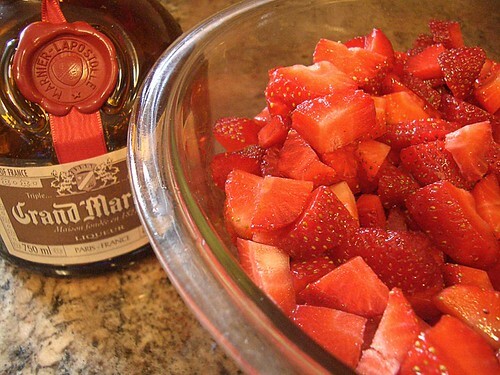 I diced up freshly washed strawberries and mixed them with a splash of Grand Marnier Liqueur and a sprinkle of vanilla sugar. The biscuit should be tender but able to soak up all the strawberry juices without falling apart or tasting dry and bland. Start by washing and dicing the strawberries. Add to the bowl a splash of Grand Marnier Liqueur and a sprinkle or two of vanilla sugar to taste (I make my own vanilla sugar by placing a vanilla bean in a small container with granulated sugar). Mix together and let set while you make the biscuits. Preheat oven to 475 and place parchment or a silpat on a baking sheet and set aside. Place a medium bowl and beaters into refrigerator to chill for whipped cream. Whisk together the flour, baking powder, 1 Tablespoon sugar and salt in large bowl. Set aside. In a medium bowl whisk together the buttermilk and egg. Add the melted butter and stir until small clumps form. Add the butter mixture to the flour mixture and stir until well combined and dough comes together. Make sure no clumps of dry flour remain. 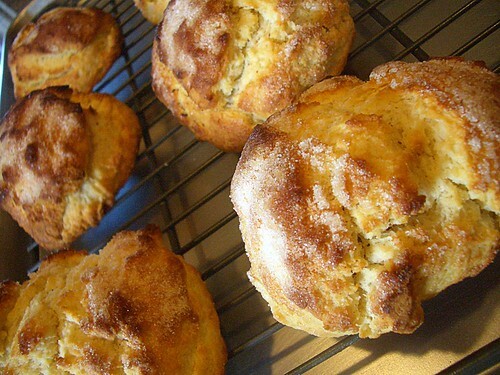 Using an ice cream scoop or a 1/3 cup dry measure, scoop out mounds of dough and place on baking sheet around 1 1/2 inches apart to create six biscuits. Sprinkle remaining 1 tablespoon of sugar over tops of biscuits and bake for 15 minutes (watch carefully) until tops are golden brown and crisp. Transfer biscuits to wire rack and let cool at least 15 minutes before assembling the shortcake. While the biscuits are cooling, make the whipped cream. Take the bowl and beaters out of the refrigerator. Pour around 1/2 cup cold whipping cream, splash of vanilla extract and sugar-to-taste into the cold bowl. Start beating the cream on low speed until bubbles form then increase speed to medium, as the cream becomes thicker switch to high speed and beat until the creams forms soft peaks. To assemble the shortcakes, split each biscuit in half with a serrated knife and spoon some berries and juice on the bottom half of each biscuit. Top the berries with a generous helping of whipped cream and cap with the biscuit top. Serve immediately. The biscuits can be made 24 hours in advance, just keep in an airtight container until ready to use.